Ready to wash your paper woes away? Smart Service power washing software will help you do exactly that. Digitize your schedules, invoices, estimates, and forms with this easy-to-use scheduling and dispatching system. 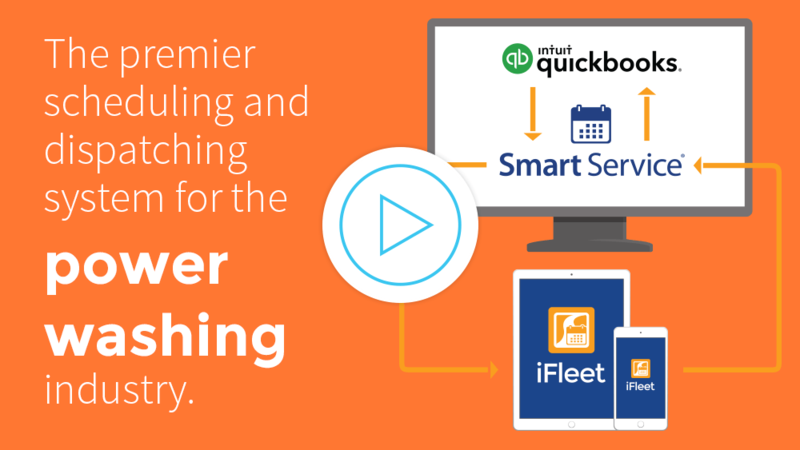 Smart Service gives you the ability to go paperless, integrating with QuickBooks every step of the way. We know you probably already use QuickBooks for your bookkeeping needs, so we don’t want to add any complexity to your established system. Smart Service pressure washing software works as a direct QuickBooks add-on. This means everything done in Smart Service updates records in QuickBooks immediately. Keep your process simple and keep your records clean. Learn more. Between the work orders, invoices, and estimates, you have your hands full—often quite literally—with paperwork by the end of the workday. Simplify and go paperless with Smart Service power washing software. Schedule a job, and you automatically create and dispatch an electronic work order to your crew in the field. Once they start working, they’ll fill it out, present it to the customer as an invoice, and send the completed job (replete with signature) back to the office. Learn more. The mobile Smart Service power washing app will make your dreams come true. With one convenient mobile tool, your workers will have all the data, customer info, and forms they need to perform the estimates and services that keep the lights on in your business. This tool updates in real time, keeping everyone—dispatchers, technicians, customers, and managers—on the same page all day, every day. Request a demo to see Smart Service power washing software in action today. Learn more. Push the limits of what one power washing company can do. Take a look at what customers think of Smart Service! Empower your power washing empire with some fresh business tips!